Arriving at Beacons is something of a strange event. After 5 hours slogging up the A60 through Birmingham, and the endless miles of congestion that drag out from the city, you find yourself, five minutes and 4 winding miles after turning off the main road, abreast of one of the most beautiful views you’ll ever see. ‘God’s Own Country’, some-one muttered, and it was, something that would become clear on day three for different, if equally impressive, reasons. After an evening wandering through clusters of bucket hatted boys, pink skin on show at the top of their cuff-high Nike socks, lit cigarettes dangling as if to ward off the gloaming, we give up on the pre festival entertainment and slog back to the tent to sip warm Carling and eat the sliced chorizo bought as emergency rations at the Congleton Tesco express. ‘Cheers George’, the half naked George has been bouncing for 10 minutes now and even his mates seem unsure as to what the end-game is. Ben Thompson, the vocalist for Sheffield post-emo two-piece Nai Harvest leans away from his mic as if considering his options. George is near us now, his glistening back just inches from the 4 pound lager bought to ward off such moments of social interaction. ‘This one’s called Buttercups’, George is twitching, inching closer to the waist high metal barrier that separates the stage from the two-thirds full Noisey tent. The end game’s obvious now, George is going to leap, like some sweaty salmon, to join his heroes on stage and both they and him and us and most of the crowd, but amazingly not the security, who clump a few yards away, are acutely aware of this. ‘I don’t want to feel like a low life, stab me in the chest, with your knife, fill me up again with…’, George has gone, clambering over the barrier and bounding, a puppy off the lead, towards Thompson. As two security guards pummel the beaming George off stage -enthusiasm in arrest more than making up for sluggishness in prevention- Nai Harvest close off their set and I go back to the lager, a reassuringly bland end to a surprisingly enthusiastic early-afternoon. Beacon’s organisers it seems are unable, or perhaps unwilling, to put on any band that might be considered ’normal’ by any widely used standard. Instead what we’re faced with is a revolving menu of sweaty degenerates who scream, and shake, and groan and thrust themselves onto the middling audience with admirable enthusiasm -even if their only reward is attentive clapping-. 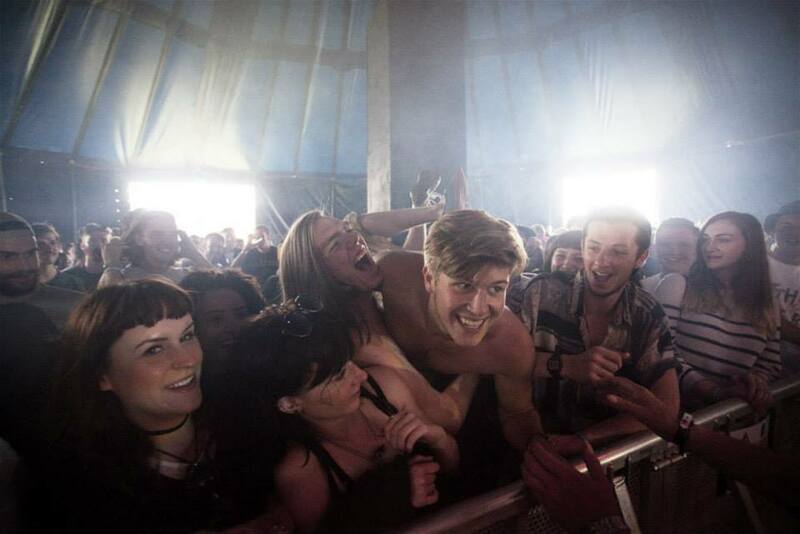 There are no, or at least very few, ‘clean cut young men’ stalking the stages, especially down at the south end of the venue where the exposed Argyll stage is situated, and where we catch Manchester’s Kult Country. Looking like a man in the final stages of a heavy bout of Malaria, Yousif Al-Karaghouli, the messianic front-man, is crouched, a quivering wreck surrounded by his acolytes as shuddering waves of psychotic melody wash off and over the stage. Although Daughter and Action Bronson both played entertaining, and to varying extents technically impressive, sets at other points on that first day it’s these two acts that provide the focal point from which the rest of our weekend seems to spring. Although both bands produce very different sounds -Nai Harvest scrappy slices of chorus-heavy scuzz and Kult County synapse-splittingly intense psych- the two represent the best of what Beacons offered. Bands who genuinely believed in their music and an audience who genuinely believed in the bands. Action Bronson, by contrast, seemed like a man throwing scraps of steak to some frenzied Labrador. Photos of Nai Harvest by @CBethell_photo.